Lately I have been more into cleaning my house than ever. It's almost enjoyable now. Especially when I wake up the next morning. Yay for me! A few things that have been helping me through it have been my cleaners. Mrs. Meyer's isn't new to anyone, but it hasn't been sold in Boise for all that long. So I happily took the plunge and bought the all purpose cleaner. I love that it is a concentrate and that it will last forever. It is a great bargain in the end. Plus it smells amazing. I am loving it so much and I use it for everything. I clean the counter tops, floors and bathrooms with it. When it says all purpose it means it! Another thing I have been doing recently is making my own febreeze. I Love febreeze a ton because I am allergic to most candles and a lot of scent air fresheners. As much as I want to spray it paired with the cost can add up. So I found an easy recipe here at Fake It Frugal. Overall it works great. I do have to shake the bottle before I use it. No big deal. I used downey and I love that smell so it has been great. I might experiment with different softeners next time. I will disagree and say that it has less staying power than real febreeze but I still give the recipe 2 thumbs up. Next up I am going to try and make my own hand soap because this recipe at The Farmers Nest looks awesome. Any cheap and wonderful cleaning tips up your sleeves? I'd love to know! I think I have pinned all of the ones you mentioned! I love Mrs. Meyers products! They smell amazing and work really well! 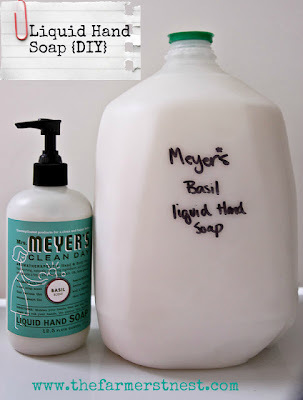 I know this is an older post but I just discovered your blog and I must say, I love Mrs. Meyers too but ever since I saw this recipe appear on Pinterest for the Mrs. Meyers bar to liquid soap, I can't seem to find the bar soap anywhere! Have you found anywhere that sells it? Also, I love the febreze recipe and can't wait to try it. I'm wondering if it leaves any kind of film, though, on your furniture or carpet? Spraying that much sticky fabric softener in the air seems like over time it might be a problem. Hoping not, because I've been looking for something just like this!